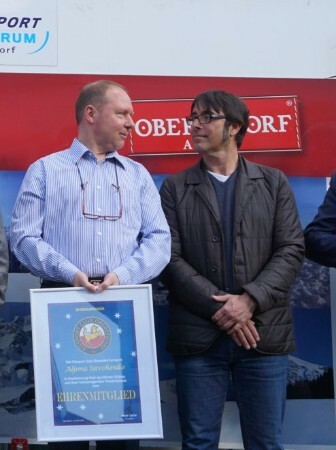 The Ice Sport Club Oberstdorf celebrated their Olympic Champions Aljona Savchenko and Bruno Massot on April 18 with a reception and dinner. Several 100 people attended the public part of the reception outside in bright sunshine. The skaters said that they have not yet taken a final decision about their future. “When we have decided, we will announce it. First we go to Korea and want to do nice shows there”, said Savchenko. “We have now a lot of shows”, added Massot. Following the shows in Korea, the couple will perform in Italy and Japan in the upcoming weeks. The World Champions surprised their coaches Alexander König and Jean-Francois Ballester with small replicas of their Olympic gold medals, made from real gold. “Our coaches are like our second parents for us. Unfortunately, there are only medals for the athletes, therefore we had made medals for the coaches”, Aljona revealed. The German Figure Skating Union plans a press conference in the next week where Savchenko/ Massot will announce their plans for the future. The skaters had just returned from their vacation a few days ago. Aljona spent two weeks with husband Liam Cross in the Dominican Republic while Bruno and his fiancée Sophie Lefauvre went to the Maledives. Bruno revealed with an Instagram post that he will become a father. The baby is due in October.